We grew up in the Santa Ynez Valley and the Central Coast, and have lived here for the past 20 years. 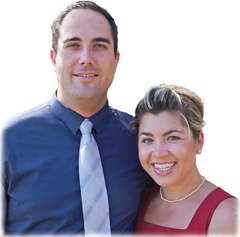 Aaron has degrees in Software Development and Business Economics, and Jessica has a degree in Business Administration with a concentration in Accounting. Aaron has a combined 10 years of management and software development experience in the service and nuclear industries, and Jessica has over 12 years combined experience in accounting and mortgage banking services. This background and education, along with our dedication to providing an excellent buying and selling experience, create a unique combination of skillsets that are often not found in the real estate industry. We believe in offering the kind of individualized and high quality service that we would expect ourselves, and look forward to working with you and showing you The Côté Difference. We know what it can feel like to have someone working for you who doesn't have your best interests in mind, and that is why we are so dedicated to our clients. We want you to feel like you can trust us, and to know that we are always working toward making sure that the goals you have in mind are achieved. We pride ourselves in being leaders in the work we do, and in utilizing the latest technologies and techniques to achieve those goals. We work for you, and are excited about helping you buy or sell your home or property. Selling your home shouldn't be painful, in fact, it should mean an exciting change of moving to a new home or to a new area, and we are here to work for you in helping it be that enjoyable process you're looking for. We integrate the latest technologies in promotion and marketing for our clients to bring in the largest amount of buyers in the shortest amount of time. Your home is special, and we work to make sure that it's properly presented to the world. Below are the services we offer for all our homes, and of course, we work for you, so all services are at your discretion. Whether you're a first time home buyer, or looking for additional properties, finding that perfect home is a fun process that can be bogged down by the details. This is why we are here. We will walk you through the process, and use our network in the real estate, lending, and escrow industries to bring together the right people at the right time, and provide you with timely and accurate information. We are immersed in real estate every day, and have a first look at new properties that are coming on the market. We don't expect you to have to be the person bringing us information about the new properties you're interested in. This gives you an advantage as a buyer, and helps you to find the right home at the right price. Below are the services we provide to you as a buyer, and of course, we work for you, so all services are at your discretion.